Only months after the Transition, the great powers scramble to develop the weapons of tomorrow. The year 1942 is now a world of crude jet fighters, monstrous attack helicopters, and unholy dirty bombs - a mongrel technology, born decades prematurely. Then, in a radical rewriting of history, Japanese forces sweep into Australia, foreign agents begin a campaign of terror in the USA, and Germany prepares for an all-out attack on Britain. The 21st-century forces must resort to the most extreme measures yet and face a future rife with possibilities - all of them apocalyptic. Picking up from where he left off with Weapons of Choice, John Birmingham shocks and awes us with this gripping second instalment in the Axis of Time trilogy. ©2006 John Birmingham (P)2009 Audible, Inc.
Heard the first one HAD to get this one and just got tne last of the three part series. Too bad it's almost over, would make for a great movie but guess it'd be too long. A very good read, i like it very MUCH!!!!!!!!! I've read many alternate history books and milti-universe genre books over the years. This is fast becoming one of my favorite series. Worth the time, an excellent read. I was expecting a spin on The Final Countdown. This series definitely was a different take on things. An excellent well thought out book. 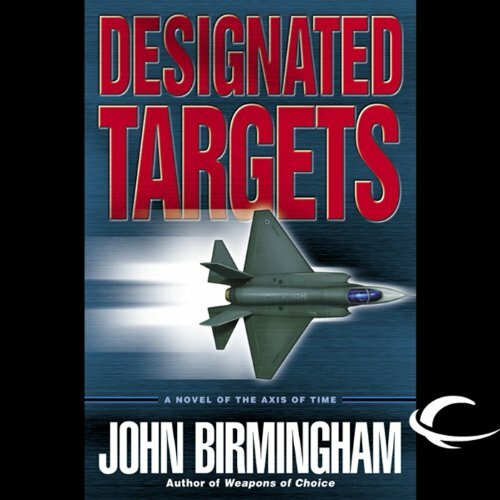 Designated Targets is the first book of a military, political, social alternative history trilogy that shows what can happen when an experiment in quantum physics goes terribly wrong. It is very clever, well written, and even somewhat thought provoking. It only requires you to suspend your disbelief a bit. The trilogy is a most entertaining listen or read. Great story but when the narrator does two of the female voices, he make them sound like "Mort Goldman" from Family Guy. Every time I hear one of their voices I picture him. Kind of a distraction from an other great narrative. First - the narrator is splendid though female voices are not his strongest. Nothing changes meaning the Allies get the good stuff but Axis not so much. Therefore the story gets predictable. I liked it nevertheless. the story is detailed and the characters are well written. The history, or rather alternative history really peeks my interest. I am looking forward to the 3rd. book. A second wondering what happened. Definite must read and gripping second in the series book. Will read the final book.